Perfect Your British English Accent! Online British English Pronunciation Course: Learn To Speak Standard, Neutral RP British English. Please use this form to ask any questions – we aim to reply on the same day. An honours graduate of the celebrated Webber Douglas Academy of Dramatic Art (1906-2006), Glen trained in voice and speech under Michael Griffiths, Caryll Ziegler and Stewart Pearce (Head of Voice at Webber and later Master of Voice at Shakespeare’s Globe Theatre for Mark Rylance). Glen was Webber’s Acting Head of Voice for a time and then subsequently established his own Voice Department at The London Drama School. He works almost full-time as an actor and voice artist – but when time allows he loves the chance to return to voice and speech training. In addition to his numerous acting students, Glen has coached celebrities, CEOs, newsreaders, presenters, GPs and lawyers. His great passion is accent modification. Not, he stresses, the “removal” of a person’s often unique and beautiful native accent, but rather, teaching an additional, neutral and more universal British English accent which can be adopted whenever required. His goal: for his students to be able to move back and forth between accents as easily as Richard Burton would move from his native Welsh language or accent to a clear, expressive and muscular classical RP. 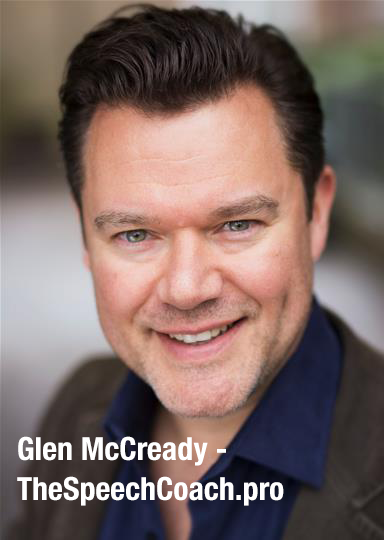 Glen teaches all aspects of voice and speech, he can work to correct speech faults and can help actors acquire new accents. He is fluent in phonetics (the IPA or International Phonetic Alphabet) which is why he was one of the voices selected to record the guide pronunciations for the “Longman Pronunciation Dictionary” working with its editor Professor J C Wells.